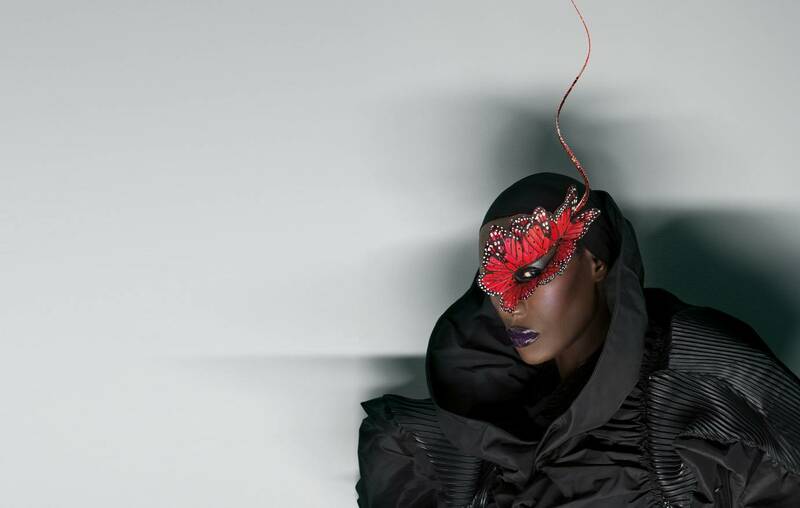 Born in Jamaica before relocating to Syracuse, New York with her family, Grace Jones embarked on a successful career as a model in New York City and Paris before becoming an iconic figure in music. In 1977, Jones secured her first record deal resulting in a string of dance-club hits including “I Need A Man” and her acclaimed reinvention of Edith Piaf’s classic “La Vie En Rose”. The three disco albums she recorded, Portfolio (1977), Fame (1978) and Muse (1979), generated considerable success in the market and established her as a major recording artist. During this period Jones became a fixture on the international club scene and was often seen at New York City’s famed nightclub Studio 54. Jones also became a muse to Andy Warhol who photographed her extensively and created a series of iconic portraits of her. Towards the end of the 1970s, Jones adapted the emerging new wave music to create a different style for herself. Working with Island Records producers Chris Blackwell, Alex Sadkin and Compass Point All Stars, she recorded the critically acclaimed albums Warm Leatherette (1980) and Nightclubbing (1981). These included reimaginings of songs by Sting (“Demolition Man”), Iggy Pop and David Bowie (“Nightclubbing”), Roxy Music (“Love is the Drug”), Astor Piazzolla (“I’ve Seen That Face Before (Libertango)”) and Tom Petty (“Breakdown”). Both albums included tracks co-written by Jones herself including “A Rolling Stone”, “Feel Up” and most notably, the post-disco dance track “Pull Up to the Bumper” which spent seven weeks as #2 on the U.S. Billboard Hot Dance Club play chart and became a Top 5 single on the U.S. R&B chart. Parallel to her musical shift was an equally dramatic visual makeover, created in partnership with artist Jean-Paul Goode, with whom she had a son. Jones adapted a severe, androgynous look with square-cut hair and angular, padded clothes. Jones’ next release was the dub reggae-influenced Living My Life (1982) which featured the self-penned hit “My Jamaican Guy”. In 1985, she worked with Trevor Horn for the conceptual music collage “Slave to the Rhythm”, and in 1986 she collaborated with Nile Rogers for Inside Story, which produced the Billboard 100 Hit, “I’m Not Perfect (But I’m Perfect For You”), one of several songs she co-wrote with Bruce Wooley. “Bulletproof Heart” (1989) spawned the Number 1 U.S. Hot Dance Club Play hit “Love on Top of Love (Killer Kiss)” produced by C&C Music Factory’s David Cole and Robert Clivilles. Jones is equally famous for her motion picture roles in such features as Conan the Destroyer (1984) co-starring Arnold Schwarzenegger, A View to a Kill (1985) co-starring Roger Moore as James Bond, the vampire thriller Vamp (in which Keith Haring famously painted her body for her role as an undead exotic dancer) and Boomerang (1992) co-starring Eddie Murphy (for which she recorded the song “7 Day Weekend”). Her autobiography, I’ll Never Write My Memoirs, was published in 2015. Relive last night's awe-inspiring EB Festival opening concert starring Grace Jones with a gallery of photos from the event and a firsthand report.